Make sure you keep your head firmly down on the stock. Keeping your weight over the front foot helps achieve this when the gun is mounted and should stop you shooting high. Stand naturally and push your weight forward on the front foot until the heel of the back foot just lifts off the ground. Use either the maintained lead style of shooting – invaluable if the window of opportunity to shoot is limited – or the pull away method. Less experienced shooters will find the pull away method easier. Maintain a smooth, unhurried swing before, during and after pulling the trigger. 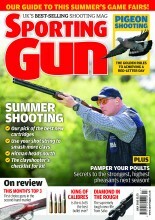 On a sporting layout shoot ‘gun up’ for the rabbit stand. 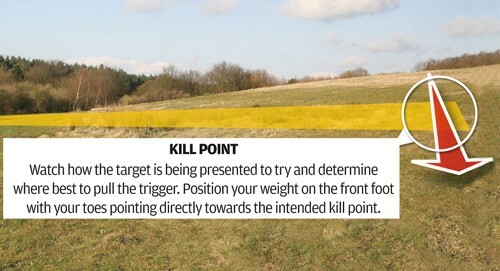 Most course designers will ensure that the opportunity to shoot the target is small, and that the kill zone is smaller still. Rifle shooters aim at targets, shotgun users have to be in front as they pull the trigger. There’s a huge temptation to point the muzzles at the clay and pull the trigger, simply because it’s travelling in just one plane along the ground. A rabbit is a target just like any other so make sure you give it some lead.